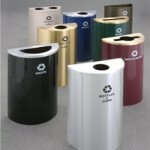 Half round trash receptacles are known for their sleek, space-saving design that helps them blend into any space while being less obtrusive than full sized waste receptacles. They neatly fit against walls or along partitions, where larger waste receptacles are often situated at the end of a room or in a corner out of the way. In addition, Glaro’s wall mounting bracket enables these units to be mounted off the floor, facilitating floor maintenance. As a result, you can spread more around every area of your facility to provide better coverage, which results in a cleaner overall facility. Because of their smaller overall ‘footprint’, the half round waste and recycling receptacles are more economical to produce and also lower in cost than many other waste receptacles on the market. For any facility looking to adhere to a tight budget, they are a very strong option to consider. A half round receptacle may also come in many different models, serving different purposes such as for waste, recycling, ash/trash or bins. Glaro’s line actually comes with and without additional inner galvanized steel liner cans (which help uphold fire safety). Either way, they are used with easy to install poly liner bags. For those whose work involves maintaining and emptying half round trash receptacles, you will be happy to know that Glaro’s models are also easy to service (empty) because of a thoughtfully engineered hinged top. Half rounders are also customizable with silk screened messages, and they are available in two metal finishes and 29 powder coat finishes. As Glaro’s Executive Vice President was recently quoted in a press piece, “Because we have total metal fabricating capabilities on American soil, we can address requests for modifications, or customized products and messages for our customers.” Whether they are used by elevators, or in restrooms, entrances, lobbies, snack areas, along walls, or in any other place, the desired “look” can easily be achieved with Glaro’s many design and finishing options. Full specifications and details on half round waste receptacles as well as downloadable brochures can be found on Glaro’s website.